What is the purpose of the wind turbine? The wind turbine will generate power for our winery operations using a clean, renewable source of energy. The wind turns the propeller-like blades around a rotor. the rotor is connected to the main shaft, which spins the generator to create electricity. How tall is the wind turbine? The wind turbine’s blades reach 396 feet into the sky (nearly a 40-story building), and the centerline of the turbine’s hub is 264 feet above ground. On a clear day, the turbine can be seen for miles. How much power is the wind turbine capable of creating? The turbine will generate 4.5 million kilowatt hours yearly. this is the equivalent of powering 467 homes or using 7,300 barrels of oil. The wind turbine eliminates approximately 3,162 tons of carbon dioxide emissions. How fast do the blades turn? The blades turn at a speed of 22 RPM (revolutions per minute). What technology does the turbine use? The wind turbine has five internal computers: one in each blade to monitor and adjust the rotation speed when necessary, one in the nacelle (which houses the generator), and one main computer in the tower base that communicates with all the other computers. This turbine has its own server at Foundation Windpower and is monitored continuously by GE. Why did you choose a wind turbine over solar panels? For our local conditions in Monterey County, turbines are more effective than solar. The wind turbine generates electricity at night, it doesn’t lose efficiency due to dust, and it doesn’t use valuable agricultural land or create the maintenance issues that rooftop installations create. 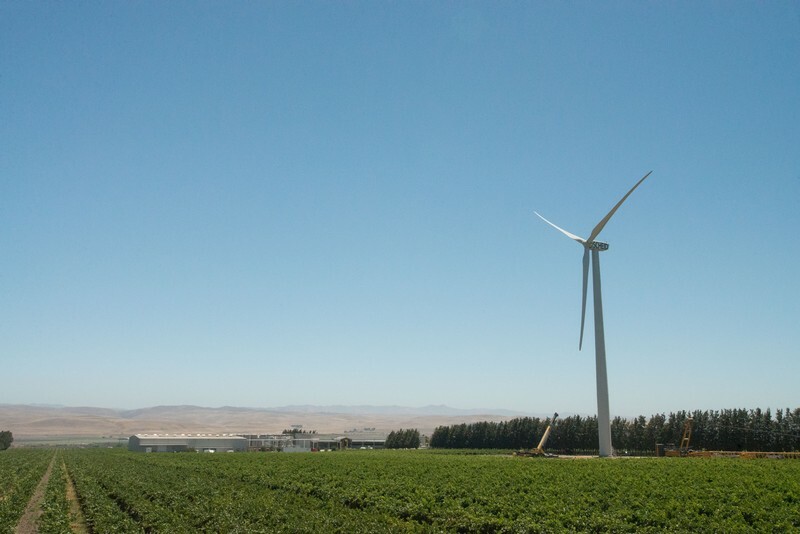 It is the perfect power source for the inexhaustible winds of the Salinas Valley. How much energy does the winery use and how much will the wind turbine offset? The winery uses about 900,000 watts at peak (0.9MW) and the turbine will generate double this load. How does this wind turbine fit into Scheid Family Wine’s commitment to sustainability? Scheid Family Wines has always been committed to sustainability. All 4,000 acres of our estate vineyards in Monterey County are officially certified by the California Sustainable Winegrowing Alliance. 100% of our wastewater is recycled and all our grape must is composted and spread as nutrition in the vineyards. We use 100% drip irrigation and low impact farming methods. we even have 250+ owl boxes to control rodent populations naturally. installing this wind turbine is yet another facet of our desire to preserve the environment.